– Allows you to conveniently add or remove ads from a single central location! 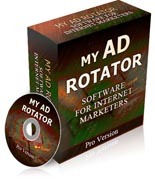 My Ad Rotator is a breeze to use and manage, even when you're dealing with a lot of pages! – Advertises your own products or those you have resale rights to so you keep ALL of the profits! You can often earn far more from your own products than if you run somebody else's' ads! – Ensures your ads are relevant to your website visitors and generate gobs of new sales as a result! You can promote the best selling product in the world, but if your visitors aren't interested in it, then your sales are going to be minimal.